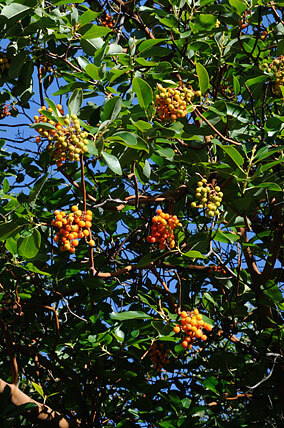 Madrone is a beautiful though difficult tree native to much of California and the Pacific Northwest. Depending on exposure, it can grow narrowly erect or widely spreading, usually 20-40 feet in height. Its picturesque branches are enhanced by smooth reddish bark which peels to expose patches of light green. Leaves of 6 inches or more are dark green above, greyish green beneath. White spring-summer blossoms in large clusters give way to bright red fall and winter berries. Sun or light shade, well drained soil, only occasional deep watering when established.